I am a great fan of melodrama, in the right place. Picture the scene: a music-hall stage in which the hero is oblivious to the bad guy sneaking up behind. Audience (to hero): He’s behind you. Bad guy ducks behind a prop just as hero spins. Hero: Oh no he isn’t. Hero spins back, bad guy leaps up again. Audience: Oh yes he is. Bad guy ducks, hero spins. Hero: Oh no he isn’t (etc etc). See what I mean? Melodrama. And very funny it is too, particularly if the actors get their timing wrong. The problem for more serious novel writers – or even, really, for comic ones – is that this sort of scene has little to do with the emotional pull of the character arc. It’s artifice; drama constructed not because something has to happen to challenge the character’s development, but as an abstract event. Now, abstract events happen all the time in the real world. But novel writing has to do something more – you have to keep the reader interested. 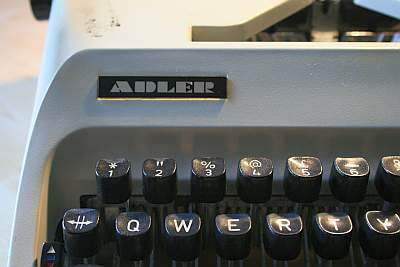 My Adler Gabrielle 25 – on which I typed maybe a million words in the 1980s. Setting a scene in which the Good Guys are being snuck up on by the Bad Guy isn’t dramatic – it’s melodramatic. It doesn’t add emotional tension relative to the characters. And you’d be surprised how often it happens, even in commercial novels – yes, I’m talking about you, Dan Brown, and that ridiculous scene in The Of Vinci Code (I know what I said) in which you tried to make a professorial exposition sequence tense by having the bad guy sneaking up on the protagonists as they pontificated. (‘Look out behind you’, ‘Oh no he isn’t’, etc). The problem for most novellists, of course, is that ideas frequently arrive as snaps of narrative event, not character development. We’re conditioned to think that way in part by the way drama is presented, often, on TV or movies – as snaps of action narrative. That, unfortunately, tends to lend itself to melodrama in a novel because it’s often divorced from the character arc. The answer, inevitable, is to integrate the character arc with the event. If you have a great idea for a scene, ask yourself what it means to the character? How does it relate to their character arc and development? What will this event do for that character arc? If it doesn’t do anything – if it’s just an event for an event’s sake ditch it. It won’t add drama to the book, just padding. And don’t worry that you’ve tossed an idea out. Writers do it all the time. The fact is that the path to a good novel is always littered with the wreckage of discarded good ideas. If I had a 3d printer I’d print the theme of my novels and put it on the table so that I’m reminded with every sentence, every line of dialogue, every paragraph and chapter: is it related to that there theme. I use the second draft of a novel to check and double check that no character is wandering, digressing or wasting time. Another specific and practical post, Matthew. As for those discarded ideas, I do keep them around as usually there is at least a kernel that I can use for another piece of writing, and sometimes, they are the impetus for a complete scene in another story. Thanks, Matthew! For my friends doing Nano – I used this guy’s blog last year a LOT. b) for some great tips that really helped when I was stuck at various points. d) He posts awesome photograps & cares about things like copyright & giving people credit/using open source. e) He’s a historian, so the history geek in me is also fulfilled. Wait – one more thing. He’s written some really interesting books.